1. Esser Agaroth talks about the film "Rise of the Right". 3. Despite the concerns of Something Different, Startup Wife Abbi, a.k.a. Commenter Abbi, is goign to Greece for vacation. Enjoy! 4. Another Airbus plane crashed - perhaps because of the automated systems on the plane. Dror compares flying on automatic rather than retaining full control...in our practice of Judaism. 5. The Jewish Worker shows how the statement "Chodosh Assur min HaTorah" is no longer relevant. We were always taught to never check in our tefillin in our luggage when flying, but to take them in our carry-on luggage. Now, it seems, this lesson must be taught regarding traveling by bus as well. Not just by airplane. According to Ladaat.net, some guy from Ashdod put his tefillin with his bags in the undercarriage of the bus. He got off the bus and realized his bag was missing. He convinced the driver to go to the various stops to look for it. They could not find it. The guy wrote a letter to Egged. They said bags in the under-carriage are the passengers responsibility, and something so valuable like tefillin should always be kept by the passenger and never placed below. After getting a lawyer, and sending letters to Egged showing that legally Egged is responsible for all bags in the under-carriage just like they are responsible for the passengers themselves, Egged decided to compensate the fellow for his loss with 6400NIS. Happy Birthday! This week is the 30th birthday of the good old Sony Walkman. Walkmans are not easy to find anymore, in today's age of having small mp3 devices holding more music than you can ever listen to in five lifetimes, but we still have a couple that the kids use with their story tapes (we still have a lot of tapes at home). 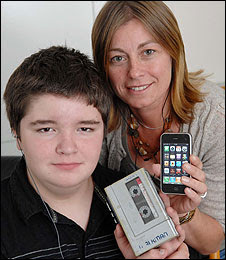 In honor of the 30th birthday of the Walkman, the BBC got a kid to trade in his mp3 player for a week and use a Walkman instead, and then compare the two. The result is a funny article of how the kid describes using a Walkman. 1. Mimi form the Israeli Kitchen was in the shuk and asked various vendors what their Friday night menus consist of. Very interesting variations. 2. JoeSettler describes what actually happened in the case of the haredi guy who hit an Ethiopian with his car that is being used to keep Justice Drori off the Supreme Court (I saw the court decision and Joe's version is accurate). 3. The Rebbetzins Husband comments on the way people talk..
Who is Amtelai Bas Karnevo? This is the name of the mother of Avraham Avinu. Today I found out that it is not just frum jews who are driven by the segulah craze, doing every segulah they hear of and ascribing more importance to many segulahs than to basic mitzvahs and behaviors. Traditional Jews always were known to do segulahs too, but today i found out the secular Jews do segulahs as well. It seems there is a "segulah" to say the name Amtelai Bas Karnevo in order to be granted success. After some discussion with a secular jew who has done this and knows other people who do it as well, it seems it is a generic segulah and can be used for hatzlacha in almost any endeavor - she used it for a university test, as did others she knows. She told me of some who used it before medical procedures. She told me of some who use it to find lost objects. And other uses as well. She told me that you are supposed to say, "Ribono shel Olam, b'zchut Amtelai bas Karnevo". Some say the name multiple times (3 times, 7 times, 18 times, each according to his own minhag, perhaps depending on the difficulty of the request). I do not know what Amtelai bas Karnevo did in her life to "merit" simply the mention of her name having become such a powerful segulah. Has anybody heard of this before? has anybody used this segulah? Do you have any more info on this? The Jerusalem Post has printed another article in their series on RBS abuse cases. This article is a response to the Jonathan Rosenblum article. Rosenblum mentions the work of Lema'an Achai only in connection with the Gush Katif refugees and those from the North. This gives the impression it is a narrowly National Religious organization. That is not true. Lema'an Achai is a tzedaka and hesed organization that serves the entire Ramat Beit Shemesh community (not only the refugees from Gush Katif and the North). Most of the families helped by Lema'an Achai are haredi (despite the fact that several leading haredi rabbis do not encourage supporting Lema'an Achai.) So its head, David Morris, certainly has no anti-haredi agenda. Most of the community - haredi and nonharedi - supports Morris's efforts. Rosenblum refers to the case against the heder rebbe being closed (the police decided not to pursue further investigation), and that this was not the outcome Morris wanted. Rosenblum misses the point entirely. The case was closed due to lack of sufficient evidence to indict and prosecute, which often happens in cases in which the primary claimants are minors - as Rosenblum, a lawyer, should know. The facts in that particular case are very disturbing (there is more than one complaint against that particular rebbe), and yet he is presently teaching young children in the same position he held previously - with the agreement of some (not all) of the haredi rabbis in the neighborhood. This is exactly the problem on which the original Jerusalem Post news story focused, and this is exactly the indifference that many haredi and non-haredi residents alike are concerned about. Rosenblum highlights the fact that Morris is not professionally trained. Morris is not a professional, nor does he claim to be. However, his organization has many professionals on staff, and he consults them on all these issues. Rosenblum knows this, and it's very unclear why he chose to give a different impression. ROSENBLUM IS CORRECT that the Ramat Beit Shemesh neighborhood is generally well educated, etc. However, many residents feel that the rabbis are "behind" the community on this issue. That was exactly the point of the original article. Rosenblum himself points out that the haredi community in general has begun to approach this issue more aggressively. That is particularly true in the US and to a lesser degree in Jerusalem. The Ramat Beit Shemesh haredi community lags behind in this area - though since the original article was published, public awareness has been raised. ROSENBLUM PITS Morris against the rabbis. Yet Morris consults with rabbinic leadership consistently, and several rabbis in the neighborhood fully support his efforts to raise awareness on this issue. Rosenblum could have easily checked this out. Why didn't he ask Morris for comment? Had he spoken to him, he would have realized that there is no antiharedi agenda coming from Morris. The agenda is to raise awareness and spark more action, and that is exactly what is happening. Rosenblum puts words in the mouth of Morris to paint him in a negative light. For example, Morris never used the word haredi or epidemic. Morris is out to raise awareness, do hesed and help protect our children. He has done, and in this case is doing, a great job. Most Ramat Beit Shemesh people think it's crazy that Rosenblum turned him into the "antiharedi" bad guy. Lema'an Achai is not the antiharedi bad guy either. As mentioned above, most of the families Lema'an Achai has been helping (some for years) have been haredi. Furthermore, some (maybe many, I don't know the exact number) of its leading administrators, social workers, therapists and counselors are haredi themselves. Unfortunately, this and the other examples show that Rosenblum was writing a knee-jerk bashing of a nonharedi person and organization who had the strength to point out a weakness in the Beit Shemesh community. Rosenblum owes Morris and Lema'an Achai a major apology. ROSENBLUM WRITES, "In addition, publicity can lead to hysteria in which parents become convinced that their children are at great risk in school. (In fact, more abuse takes place within families or involves older children as perpetrators.)" This line completely baffles me. Is Rosenblum saying that since most abuse takes place at home, we should be less careful and less concerned about abuse in school? Is that how he would (not) react if he heard about abuse in his own child's school? Rosenblum's own column closes with a call for more education and public lectures in the areas of parent/child communication and abuse. Awareness has been raised and people are asking good questions and encouraging more action. Even Rosenblum's way-off-the-mark piece is part of the solution. Thank you David Morris for being the catalyst. The soldiers are the grandchildren of the Nazis' victims, the Nazis' survivors. They have come here to consume food quickly and consume life quickly. This is the true image of Israel. The real Israel is not in the clean, lofty suburbs of Northern Tel-Aviv...It is not in the literary cafes and journalists' clubs...It is not its High Court. I saw the real Israel, its ugliness in the Jenin Refugee Camp on Monday, April 15, 2002. The rest remains decor for murder. Do you want your charitable donations to Israel to finance organizations that publish statements like this on their websites? If you donate to the New Israel Fund, then your dollars pay the salaries of the men and women who spread the above message of peace and brotherhood. Rafi has already blogged about my expose in the Jerusalem Post on MK Hanin Zoabi's support for Iranian acquisition of nuclear weapons. He also "filed a complaint with the Organization for Quality Government about how she can be allowed to serve as MK in Israel considering things she had said." Rafi was not the only blogger to write about my article. Daniel Pipes, renowned Middle East scholar and columnist picked up on the story as well. I contacted Mr. Pipes and the result was a commission to write a report with David Bedein on I'lam, the Arab media NGO that Zoabi co-founded in 2000. What I discovered is a pattern of tendentious statements made to delegitimize Israel in the court of world opinion. These efforts were largely financed by American Jewish donors who most likely did not know the full extent of the anti-Zionism expressed by the grantee. However, the rhetoric employed was well known to the New Israel Fund, the organization acting as a middle-man between American Jewish donors and I'lam. The report on I'lam can be found online HERE. My report on Arutz Sheva is HERE and from WND HERE. The following is the article that I co-authored with David Bedein on Arutz Sheva. An Arab group which is backed by a American-British Jewish fund produced a video in which Israel was accused of point-blank executions of unarmed Arabs and sponsors lectures about Israeli "ethnic cleansing" of Arabs. The version of the film that was available on the I'lam website provides no substantiation of the claim and does not even identify the person making them or the location at which he spoke. The terminology in I’lam’s media publications abounds with terms such as “massacre” and “ethnic cleansing.” The group also employs Arabs who support Hamas and the “Right of Return” of descendants of Arab refugees into Israel. In an press release dated March 4, 2009, I’lam Empowerment Coordinator, Zaher Boulos issued a ”cry of solidarity with the Palestinian people who hold strong to the establishment of a Palestinian state that is independent with Jerusalem as its capital and the return of the refugees to their homes” at the annual conference of the Forum of Journalists, an I’lam affiliate of which he is also coordinator. Statements of support for Hamas, which is termed the “Palestinian resistance,” have been found on a blog belonging to I’lam’s International Relations Coordinator, Nasser Victor Rego. The blog also links to the website of Hamas’ armed wing, the Izzedeen Al-Qassam Brigades, which is given as a legitimate source of information. Co-founded by recently elected Balad party Arab-Israeli Knesset legislator Hanin Zoabi, I’lam does not hide its agenda: to question the legitimacy of Israel in the court of world opinion. Under her guidance, I’lam issued press statements, engaged in lobbying over policy, led tours for foreign correspondents, provided information on Israeli-Arabs to Jewish journalists and ran Arabic language courses in journalism. I’lam views the Hebrew press as a tool of the government. Among charges pressed against Israel in materials distributed by I’lam are accusations that the Hebrew media contains “Encouragement for killing and destruction...” and that the editors of Ma’ariv – a leading daily – “call for the destruction of cities, wiping out villages and killing children.” I’lam makes similar claims regarding Israel’s most popular daily newspaper, Yediot Acharonot, stating that the editor in chief of Yediot Acharonot issued a “call to kill civilians.” Needless to say, no such call was ever made. MK Zoabi, in her capacity as director of I’lam helped draft and signed the Haifa Declaration. I’lam is financed by the Washington DC based New Israel Fund, an American and British Jewish philanthropic foundation, which also sponsors Israeli-Arab NGOs Adalah and Mossawa. All these groups call for the removal of Israel’s Jewish identity and for the return of Arab refugees to the lands inside the 1948 armistice lines. In addition to receiving funds from the NIF, I’lam is also a grantee of the organization Al-Quds: Capital of Arab Culture, a group spawned by both the Palestinian Authority and the Arab League. In her position as director of I’lam, Hanin Zoabi attended events such as Israel Apartheid Week. She also issued calls for Arabs to refuse any form of national service in Israel. In 2008 the organization held a conference in Ramallah with journalists from the PA which “aimed to develop and facilitate working relationships between Palestinians journalists in Israel and in the West Bank, and to discuss the role of the Palestinian media on both sides of the Green Line” as well as “Exploring strategies for Palestinian media practitioners in addressing Israeli, European, and US-American media.” One lecture is titled "60 Years of Ethnic Cleansing." The connection of I’lam to the Palestinian Authority is reflected by its hired personnel. The current director of I’lam, Sanaa Hammoud came to I’lam after serving as a consultant in the Palestine Liberation Organization’s Negotiations Affairs Department. Meanwhile, Wadea Awawdy, who served on the founding I’lam board of directors, when Ilam was founded in 2000, has worked as a correspondent for the official Palestinian Authority publication Al-Ayyam. Rego did not respond to email queries regarding his comments. When asked by journalist blogger Harris Phillipson whether the NIF has a problem with giving money to a group that supports the Right of Return, an NIF spokesperson wrote that “The New Israel Fund does not require ideological conformity from its grantees, and we differ with many of them on key issues." Larry Garber, formerly of USAID, has served as the Chief Executive Officer of the New Israel Fund since 2004. NIF's website claims that its mandate is “to strengthen Israel's democracy by supporting programs that safeguard civil and human rights, bridge social and economic gaps, foster tolerance for all inhabitants, and enable different forms of religious practice to thrive” and that it distributes more than $15 million annually in grants to Israeli organizations. In addition, it allocates an additional $4 million a year for a service called Shatil, which provides technical assistance to approximately 1000 Israeli nongovernmental organizations. The Middle East Forum recently commissioned a report on I’lam by the Center for Near East Policy Research which can be found online. Zachreini Na is Dov Shurin's single most successful song, thanks to everyone else stealing ti from him and not giving him credit. You can hardly go to a wedding without hearing it, along with the various other singers who have recorded their versions of the song on their albums. Uploaded by xxvirtualxx. - Music videos, artist interviews, concerts and more. 1. Snoopy is hosting this week's edition of Haveil Havalim - the Hot and Humid edition - #223. 2. Hirschel Tzig has the pics of a recent meeting of askanim from Bnei brak with the Satmar Rebbe - a doctored pic and the original. And he makes an interesting point. 3. Pesky Settler quotes an article about how the Palestinians are in favor of continued settlement construction. Simply to provide the PA Arabs with jobs. 4. At Moving on Up they have the latest on aliyah, about how they got their new drivers licenses. 5. A Soldiers Mother recaps the efforts to raise awareness of Gilad Shalit's plight this past Thursday via Twitter. I am proud to say I was part of it. 6. In David Ben-Gurion's blog (amazing what can happen with the internet, isn't it - this blog refreshes Ben-Gurions old writings and letters in a blog format) he describes his meeting with the Hazon Ish about keeping shabbos. He quotes the Hazon Ish as having said, "There are things for which we will give our lives. Despite the fact that we are a minority, if we give up of ourselves, we will be strong, and no power will be able to overcome us." Whatever side of the debate over RBS 3/C/G you are on; build, don't build, haredim, secular, dati leumi, percentages, graves, whatever, you are sure to find this surprising. Last week, Councilman Moshe Montag, director of the office for construction and planning in City Hall, spoke out about the recent fights over RBS 3. He was quoted as having said that RBS3 would be completely Haredi. I am taking the quote out of context, as the rest of what he said did not matter. That statement created a storm of responses, mostly angry, among other councilpeople, editorials and columns in the local papers, residents, etc. The most surprising of all the responses was the following - Activists from the local Shas party protested his statement. 1. They have protested his conquering of the whole RBS3 - Montag indicated he would call it Kiryat Degel haTorah (and some are nicknaming it Kiryat Montag) and immediately settle thousands of haredi litvishe couples there. The Shas people are saying that over their dead bodies will it be "Kiryat Montag". Rather the first part will be Kiryat Yosef, named after Rav Ovadia, the second will be dedicated after Shlomo Benizri, etc. The name is less important - more important is the feeling that they have that Montag is usurping RBS3 for Litvishe haredi and Shas is not going to take it sitting down. They want it for Sefardic couples. 2. They protest the intended demographic as stated by Montag. Shas people were quoted as saying "Bet Shemesh might become haredi, but not in the Bnei Brak sense of the word. Everybody who wnats to live here will be able to - sfardim, ashkenazim, hassidim, litvishe, dati leumi, and secular.Yes, also secular. The way of Rav Reuven Elbaz is to bring people close, not to distance them. If we live in isolation - only with haredim, upon whom can we have any influence? We want secular Jews of all types - Ethiopians, Russians, French, American, everybody is invited to build in Bet Shemesh." "We don't want the city to go down the drain. We are not interested in living in cities like Elad or Kiryat Sefer - whoever wants that can move to those cities." "We thought we were together, that we were discussing solving the housing crisis for everybody, and not just for one community". I was definitely surprised to see Shas attack Montag about this. Where is the Holy Ark? A few days ago it was reported that an Ethiopian Patriarch was considering revealing the secret of the Lost Ark, and the Ark itself, and how his church has been holding it for thousands of years, and would likely do so on Friday in Italy. Turns out he preferred keeping the secret (or had nothing to show) and said nothing on Friday. He had not even scheduled a press conference. The agency had reported an announcement would be made at the Hotel Aldrovandi in Rome, and a hotel spokeswoman told WND Pauolos had been in residence there, but no news conference or event was scheduled. "The Ark of the Covenant is in Ethiopia for many centuries," said Pauolos in the report. "As a patriarch I have seen it with my own eyes and only few highly qualified persons could do the same, until now." Bob Cornuke, biblical investigator, international explorer and best-selling author, has participated in more than 27 expeditions around the world searching for lost locations described in the Bible. A man some consider a real-life Indiana Jones, he has written a book titled "Relic Quest" about the Ark of the Covenant and participated in History Channel production called "Digging for Truth." Next week, Cornuke will travel to Ethiopia for the 13th time since he began his search for the Ark. He told WND he believes it is possible Ethiopia could have the real artifact. "They either have the Ark of the Covenant or they have a replica that they have believed to be the Ark of the Covenant for 2,000 years," he said. Cornuke said, if it is genuine, there's a plausible explanation of how the Ark may have come to the Church of Our Lady Mary of Zion in Ethiopia. "The Ark could have been taken out of the temple during the time of the atrocities of Manasseh," he said. "We have kind of a bread crumb trail that appears to go to Egypt, and it stayed on an island there for a couple hundred years called Elephantine Island. The Ark then was transferred over to Lake Tana in Ethiopia where it stayed on Tana Qirqos Island for 800 years. Then it was taken to Axum, where it is enshrined in a temple today where they don't let anybody see it." Cornuke said he traveled to Tana Qirqos Island and lived with monks who remain there even today. "They unlocked this big, four-inch thick wood door," he said. "It opened up to a treasure room, and they showed me meat forks and bowls and things that they say are from Solomon's temple. When the History Channel did this show, they said it was one of the largest viewed shows. People were fascinated." He said Ethiopians consider the Ark to be the ultimate holy object, and the church guards the suspected artifact from the "eyes and pollution of man." "In Ethiopia, their whole culture is centered around worshipping this object," Cornuke said. "Could they have the actual Ark? I think I could make a case that they actually could." Cornuke explained that a special guardian lives inside the church which reportedly holds the Ark and never leaves. Once a guardian is appointed, he stays until he dies and another man replaces him. "We know for a fact that there have been 30 guardians in history who have never left that enclosure," Cornuke said. "I know the guardian. When CNN and BBC went over there, he wouldn't see anybody but me. So I went and talked to him, and he's getting very aged. He told me they have the real Ark and he worships 13 hours a day in front of it. When he gets through, he is covered in sweat and he's exhausted." He said he met a 105-year-old man who claimed to have seen the Ark 50 years ago when he was training a replacement guardian. "It frightened him to death when he got a glimpse of it." Cornuke said he also met with the president of Ethiopia nearly nine years ago and had a one-on-one conversation with him in his palace. He asked if Ethiopia had the Ark of the Covenant. According to Cornuke, the president responded: "Yes, we do. I am the president, and I know. It's not a copy. It's the real thing." "Toughen his stance"? How exactly toughen his stance? What is he going to do - threaten the western world with something worse than nuclear weapons? 1. The past weeks we have seen debates in many arenas about whether or not there was a promise by the Bush administration, possibly a secret promise and understanding, to the Sharon government about natural growth. Sec. State Hillary Clinton and various aides have categorically denied it, saying straight out the the Bush letter to Sharon is extremely vague and contains no such promise, and there has been no promise substantiated elsewhere. In the following opinion piece written by Elliot Abrams in the Wall Street Journal he says straight out that there was such a promise and understanding by the Bush amdinistration and the Obama administration is wrong in their denial of the agreement. The agreement was part of a broad agreement on various issues that came up between Ariel Sharon and George Bush's government and there was a clear understanding to allow natural growth in the settlements. Where is the Chillul Shabbos? In light of the decision by Mayor Nir Barkat to open the Safra parking lot this Shabbos, by using a non-Jew to run it and allow parking free of charge, I have a question for those who are disturbed by the chillul shabbos mandated by the City of Jerusalem. What is the chillul shabbos? The secular Jews and non-Jewish tourists are driving anyway. This is simply allowing them to park "here" instead of "there". Do the Eidah people demonstrate every time someone in their neighborhood uses a shabbos goy to turn on the lights or airconditioner? Perhaps using a shabbos goy to operate a free parking lot is not ideal, but where is the chillul shabbos that deserves such strong protest? Please explain this to me. I too am against chillul shabbos and wish everyone in Jerusalem and every other city would keep shabbos, but where in this case is the chuillul shabbos that needs to be protested? And while on the topic, one of the reasons given for the protesting is because they claim the secular are breaking the [famous] "status quo" of religious-secular relations. On the issue of the status quo I would like to know what was included in the original status quo? What can and cannot be done based on the status quo? Do only the secular have to keep the status quo? Are the religious taking over secular neighborhoods not breaking the status quo? When they fight to put up their eruvs, mikvas and shuls in traditionally secular neighborhoods like Kiryat HaYoverl and Bet HaKerem, is that not breaking the status quo? 2. Michael Sedley has an interesting question about benefiting today from Temple artifacts. I have wondered about this in the past as well, but more in the tune of if someone takes pieces of artifacts - stones from Temple Mount for example. 3. Free Thought discusses the increasing alienation Israelis are feeling by the Obama administration, and a possible outcome of it that could be good. 4. Cross-Currents has an interesting post about the greatness of the Chazon Ish, and whether the Jewish people and the world would have been better off had he become a doctor rather that sat and learned. There is what turns out to be an interesting machlokes among modern day poskim as to what is the cause for our prayers not making it up to heaven. Rav Moshe Sternbuch was recently quoted widely as having said that not being careful enough in issues of shaatnez is the issue disturbing the ascent our prayers. Today, Rav Wosner said something that seems to indicate he argues. Rav Wosner said that our talking during davening, and our being busy with other things not related to tefilla, along with ringing cellphones, is what causes our prayers not make it up to the top. He added that if we would stop talking during davening, nobody would get cancer anymore. "Ploni" was outside a building in Jerusalem and saw 2 young girls looking around the area, concerned, as if they had lost something. Ploni asked them what is the matter. They answered that they had found a screwdriver a few days ago. They put up a sign in the building and attached the screwdriver to it, so the owner would see it and take it. Every day they were removing the sign from the building lobby and moving it to the lobby of the next building. That way eventually the owner would likely see it (assuming he lived or frequented one of the buildings in the vicinity) and be re-united with his screwdriver. Today they had gone to move the sign and screwdriver to the next building and it was no longer there. They were concerned it had maybe fallen down and were looking for it. 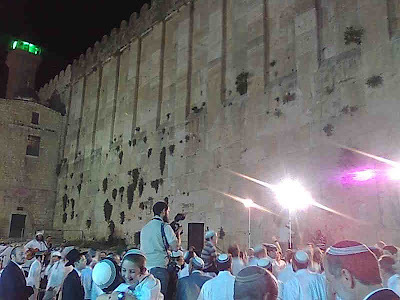 After a bit they decided that they must have fulfilled the mitzva of hashavas aveida as the owner had probably taken it. Last week I lost something very expensive. I looked all over and could not find it. I went back a few times to where it was lost to see if maybe I missed looking somewhere - under a bush, under a bench, etc. Last night a teenage boy calls me up and tells me he found it. He heard from somebody that I had lost the item and was looking for it, so he looked up my number and called. He saved me a very big expense I would have had to replace it, yet he refused a reward. Tizke Le'Mitzvos! People are inherently good. Hakshiva is holding a fundraising raffle. Hakshiva is saying NO to kids who need mentors. Hakshiva is saying NO to parents who need guidance and support. population growth of adolescents in our community . difference to the healthy growth of our community. But it’s not really Hakshiva saying NO. It’s the community that is saying NO. Hakshiva is going to be fine. But is Ramat Beit Shemesh going to be fine? Tickets cost: $36 or 150 Shekels. ere is a discount for more tickets. Please join us. For the future of our community. Hakshiva is a wonderful organization that helps local kids who need a "big brother" and extra attention. They help them succeed in school and in life, by helping get through their issues and problems. If you can help Hakshiva, so they can continue saying yes to developing programs for the kids, and so they can continue saying yes to the kids, and parents, who turn to Hakshiva, it would be like saving a life. In todays bad economy, they have had a hard time raising money for their programs. Here is a way to help them and possibkly help yourself by entering the raffle, but definitely helping yourself by having an organization like Hakshiva be able to continue functioning in RBS. Buy a raffle ticket for the Hakshiva raffle. Are you in the market for a new mattress? If not, maybe you should be.. Comfort Living, Ltd. has developed a Visco Memory/Foam Mattress that I hear is out of the world, and is reasonably priced. Comfort Living's Visco mattresses enable your spine to stay in a more natural position. Our memory foam responds to your body temperature and weight, reducing pressure points and creating the perfect blend of softness and support for less tossing and turning and improved circulation. 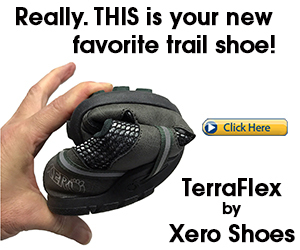 They offer a 30 day trial, and it is worth checking out. Take a look at the Comfort Living website for other products as well, but what you really should be interested in is the Visco Memory/Foam Mattress. 2. Open Minded Torah witnessed an accident, and got a different perspective..
4. Not Brisker yeshivish has an interesting, and perhaps surprising, story from the Hazon Ish. 5. A Soldiers Mother started a project of tweeting for Gilad Shalit for this Thursday.. I believe the government of Israel has to retain its control over the State lands. At the end of the day, Israel is not just a piece of ground. We are not just talking here about real estate, but about the future of the State of Israel and the Jewish People. In my opinion it is time to throw the Arabs off of Temple Mount. At minimum, take away their de facto control of the site. Today the Minister of Internal Security went up to Temple Mount to tour the compound and survey the police deployment. Totally legitimate. Not a bunch of religious Jews trying to build the Temple. Not a bunch of religious Jews harming the Arab sensitivities by praying, God forbid. Simply the guy in charge of the police going to a highly sensitive location to see how the police work up there. The Wakf is threatening an intifada ("trying to ignite a war"), and the Arabs are incensed over the visit, calling it a provocation. I think throwing them off the Mount will solve the situation. If not completely, then at least after a waiting period of 6 months or a year with no access at all. Teach them a little humility, and teach them that they are not the only ones here. And then, if they want access, they can have it like anyone else - no more than Jews, if not less. Rabbi Sherman of the Rabbinical Court has invalidated another conversion. I don't want to relate to the specific case, as I am not familiar with the details, nor am I an expert on the laws of conversion. on the one hand I think he is very bold. To do this again after the firestorm he created the last time he invalidated a conversion takes a lot of inner strength, conviction, and belief that you are doing the right thing. That he was now influenced by concern of the fallout, but did what he felt was right, draws a certain sense of admiration from me. On the other hand, it is incomprehensible that people should go through a[n already super strict] process, crossing all the t's and dotting all the i's demanded by the authorities, and will proceed to live their lives as Jews, and years later some other rabbi will be able to come forward and invalidate all that and make your whole life into a scam. Obviously in extreme cases where they find fraud or problems with the process, if that is what is needed to be done, so be it. But to just be able to do so, I would not say "on a whim" but perhaps I would say "so easily", seems to me to be very problematic and morally wrong. Again, I am not relating to the specific case of the woman whose conversion Rabbi Sherman canceled. I don't know her situation. But this whole process should be different. Either the original conversion process should be different, yet it is already controlled by the Orthodox Rabbinate, so how much different can it be? Or the post-facto relationship with the authorities has to be defined better to avoid such situations. But I don't see how this can continue that people go through an official process and then years later they are told that it was all worthless. What do people have against riding with helmets? I just read in the paper that to protest an upcoming vote on a law requiring people riding bikes and rollerblades to wear helmets, a group opposing the law will hold a protest tonight. The protest is that they are going to be riding their blades through Tel Aviv tonight in their underwear and helmets. They say that if they have to wear helmets, they will forgo other clothing. They claim the law is too "all inclusive". they think the law should only require children, and riders on inter-city roads, to wear helmets, but not adults on city roads. For some reason they say many people will not ride because they prefer not to ride at all rather than ride with a helmet. Why do adults not need the safety gear for protection? Being nominated to the Supreme Court in Israel is nothing like in the United States. Who doesn't remember the process as it took place when Robert Bork was nominated? the nominee has to be vetted and then the Judiciary Committee has to approve it, then the Senate votes on it after having hearings to squeeze out all the nominees possible opinions on anything from abortion to his favorite flavor of ice cream. In Israel there is a Knesset committee that recommends nominees to the Justice Minister who passes the recommendation on to the Supreme Court President. They have a couple internal votes of various combinations of the committee and Supreme Court and that is it. All very internal. The recent right-wing "takeover" of the judicial appointee committee has made a lot of people in the "elite" nervous, worried that they will appoint right-wing judges to the Court, as if only the left are allowed to sit in the Supreme Court. Looks like they had what to fear. The committee has made their first set of recommendations, recommending four religious judges to the Court. I do not know the qualifications of these judges or their opinions, so I am not commenting on the specific judges, but am assuming they are all qualified as far as their level of legal expertise and experience goes. Religious judges, religious people in general, are stereotyped as to being right-wing. It is often true, and might be true in the case of thee four judges as well - I don't know. Right-wing opinion is underrepresented on the Supreme Court, and religious opinion is also underrepresented on the Supreme Court. This would go a long way in presenting some balance. Supreme Court President Justice Beinish has immediately rejected the recommendations. Obviously if her reasons for rejecting and fighting these nominations are simply because of their religious lifestyle and/or right-wing beliefs, it is a further sign and proof of the elitist status of the courts. Wouldn't it be ironic if one of the candidates sued the Court for religious discrimination over this? The cracks in the hold of the left-wing elite on Israeli are beginning to widen. 1. Reb Akiva has Cell Tower art..
2. 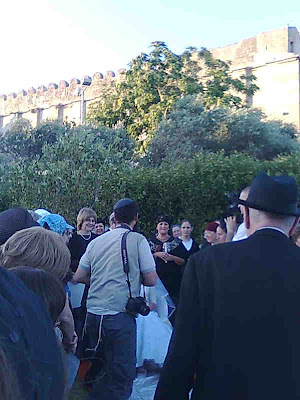 A Blob of Something Different met somebody who was happy to meet an orthodox jew! 5. Hadassah posts part 3 of "Why I moved to Israel"..
6. Dry Bones has Obama's phone call at 3am..
7. I am going to #7 today because this is a very useful post by MominIsrael - Free and Inexpensive Family Trips for the summer in Israel. 9. DovBear has a clip from an old Yiddish movie about a Jewish wedding. We have all heard of the hetter mei'ah rabbonim - because Rabbeinu Gershom put a ban on marrying a second wife, and divorce can no longer be done against the will of the wife, if the husband wishes to dissolve a marriage, he can be held "hostage" by the wife's demands, just like she can be held hostage to his demands. The hetter mei'ah rabbonim resolves the problem for the husband, because really he is allowed to marry a second wife, but we don't allow it by rabbinic decree. If the beis din can get 100 rabbis to agree, from countries spread out over three continents, the hetter will allow him to marry again, despite still being technically married to the first wife. The hetter is used, though only rarely and in extreme cases. It is famously known that the decrees of Rabbeinu Gershom only applied among Ashkenazic Jewry, and were never accepted in the Sefardic countries. That means there is no ban on marrying a second wife for sefardim, and no need for the hetter mei'ah rabbonim. That leads to a recent case in which a husband in his seventies wanted to divorce his wife claiming she never took care of him and was mean to him, and was turning their kids against him. She refuses to accept a divorce, claiming she loves him. This is despite the fact that they have been living separately for a number of years, have already divided up and split all possessions, and beis dins marriage counselor has established that there is no chance they will get back together. Yet she refuses the get. because they are sefardic, Yemenites actually (note: some old Yemenites still have multiple wives, but I don't think any new marriages of multiple wives are allowed), they had no need to obtain a hetter mei'ah rabbonim. Rather all they needed was a decision by beis din to allow him to marry again. So now it is up to the shadchanim to find him a [second] wife. get working! They are making me feel as though I am a murderer. In the hospital, her parents said to me that I killed her. True, I was driving the motorcycle, but everything is from heaven. Maybe because I was driving on shabbat God decided to take her to Him. I don't know what to think. ------Shai Kaldron, the driver of the motorcycle who hit a tree when going out for the day with his friend Danit. She was killed, and he was injured lightly. In the wake of the protests in Iran that will hopefully lead to the demise of the regime of terror there led by the Ayatollahs, an interesting discussion is raised about the efficacy and validity, more validity actually, of protests. When is it ok to protest and when is it not ok? When is it ok to protest violently and when is it not ok? In Israel, whenever people protest for what they believe in, whether it is the haredim protesting chillul shabbos, or settlers protesting the disengagement (examples that come to mind), we (as a public, not as individuals) tend to reject their right to protest, at least to allow the protests to turn violent. Yet we see from Iran that the only way to succeed in change is often to protest even violently. If they had not gotten violent, the whole thing would have been put down in a day. Not only that, but the whole world is suddenly supporting violent protest. So is it ok to support violence? Why do we not condemn the Iranian protesters that they are breaking the law and they should figure out how to protest within the law in a non-violent fashion? Clearly there is a tipping point somewhere where the protests turn violent and break the law that is acceptable. perhaps it is dependent upon the trampling of human rights, but that would make it very subjective - why is this ok in iran because their rights are being trampled, but for example it was not ok for the expellees of Gush Katif even though their rights were being trampled, and the right to protest was quashed? As a product of haredi yeshivot, I have always viewed your insistence on defending all things haredi with cynicism and a chuckle. However, how can I remain silent in the face of your attack on David Morris and Lema’an Achai? Yes, you tried to veil the attack with some form of praise; but it was an attack nonetheless. Morris, the other workers of Lema’an Achai and their esteemed rabbinic leadership are the righteous of the righteous. They devote their days and nights to helping all Jews without trying to promote one sect over another. If they have concluded that there are rabbis who are not helping to deal properly with suspicions of molestation, then this is the reality. End of story. 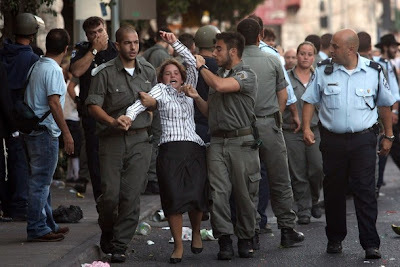 As for the rabbis you mention by name, can you also defend their refusal to publicly condemn some of the recent acts by extremist hareidim in Beit Shemesh and Ramat Beit Shemesh – such as the Friday night kicking assault on a teenage girl in December, the constant spitting upon women deemed dressed not up to their standards , and the spray painting of rebukes on our walls and sidewalks? Is this silence also “a considered philosophy about what is best for the victims?”. What I find interesting in the letter is the connection between the response and working method employed in the cases of RBS, to the responses mentioned regarding the attacks in RBS B. This despite the fact that they are 2 different crowds, different sets of rabbis, with seemingly no real connection. Yet Rabbi Lipman shows that the response is the same. perhaps it is simply the preferred method of Haredi rabbonim - to work in quiet. Though the truth is, I think, that in the case of RBS B it was not a situation of working quietly behind the scenes, but of ignoring the issue completely. 4. Not Brisker Yeshivish discusses different types of biographies..
5. Yaak has a theory why they canceled the "i before e" rule in England. "You never know what will disappear in Iran first - their enriched uranium or the wretched government. we hope it's the government,"
In today's newspaper, Yisrael HaYom, there was a short article about how Shari Arrison, the owner of Bank HaPoalim, claims to have some sort of level of prophecy. She said that she receives messages in her sleep via messages, images and words, and they have always come true. An example she gave was the global economic meltdown, claiming she received messages about it in advance and knew it was coming. Arrison says regarding the future that she has seen that people will go crazy (? ), and planes will fall from the sky. Her words of wisdom are that there is nothing to fear from these messages - before anything good happens, bad things happen. We are in the days preceding the "geulah". Right now we are in the days of dark, and the days of light are coming. She also seems to have some delusion of grandeur, as she says she is not interested in. money and physical possessions... These are not things you can take to the grave. She is interested in issues of the heart (spirituality). Arrison says she could have sold everything and sat on the beach all day every day. Yet she did not because she knows that her "job" is to ensure continued human existence. 1. If she does not care about her money and physical possessions, I would be happy to take some of it off her hands. Even if she does not want to give me any, I would be happy even if she just covered my overdraft and loans! 2. Even if you reject her prophecy and consider her a nutcase, she gives a good mussar shmooze talking about impending geulah and physical possessions not being important! I received the following by email from a fellow in England who has taken the initiative to try to arrange worldwide prayers for Gilad Shalit. I would like to inform you about a very important event I am trying to promote throughout the Jewish world but am struggling as I am only 1 person with limited connections!!! Almost 3 years ago the Israeli soldier Gilad Shalit was captured by Hamas. We do not know his situation today. One can only imagine the conditions in which this young man subsists. His parents trauma cannot be described. What can WE do to help ? We would like communities across the world to have an International Yom Tefilla the 3rd anniversary of his capture, 29 Sivan (Sunday 21 June) and recite some prayers from Yom Kippur Koton or Tehilim for Gilad Ben Aviva in each kehilla or town. This is the ONLY way he can be released. Please spread this request (a nonpolitical one) to all Jewish communities to pray to the One above for Gilad's release. May Hashem answer our Tefilos and bring Moshiach speedily! 2. Our Bs, eh sent a letter to Senator Menendez about his speech to the Senate. 5. 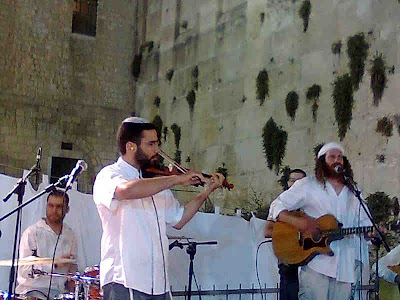 Israel in the Making reminds us of a historic shofar blowing at the Kotel.. I believe that haredi settlement in the Golan will minimize the chances of a disengagement. If we would have done that in Gush Katif, the picture would have been very different. The haredi public has very strong political power. Amaslem is recommending haredim consider moving to the Golan as a solution to the lack of appropriate housing for young haredi couple. 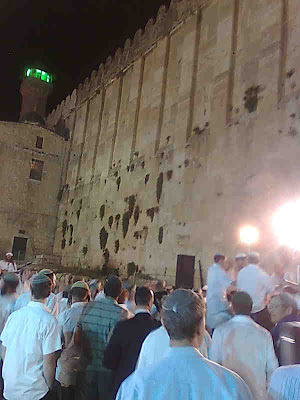 Last night was the first time I had ever been to a wedding at Me'arat HaMachpela in Hebron. I have heard such weddings are beautiful, but I had never before been at one. Last night, I finally merited to be at such a wedding, and it was amazing. The setting was beautiful in all regards; physically, the atmosphere, spiritually, it was meaningful, and it was fun (and the food was great!). The music was by Sinai Tor who was absolutely amazing. he was entertaining, he was rocking, he was leibedik, and it was great quality music. If you should have an opportunity to go to a wedding there, don't miss it! And tonight I have another wedding, this one in the Old City of Jerusalem! 1. Lion of Zion has the music video of a popular song, and points out that the singer is seemingly wearing tzitzis that can be spotted at a certain point in the clip. That is aside from the quality of the song about inner beauty. 2. Danny Brothers describes his masa kumta. 4. Reb Akiva says, "Welcome Back, Carter"
5. Michael Sedley talks about maps and hypocrisy.. I have always been a "fan" of Yossi Sarid. He came off as anti-religious, but I never really found him to be so. I found him to be more "super-liberal". I always found Sarid to be a worthy adversary in the political scene. He is intelligent and always fought for what he believed in based on intelligence and belief, and not just because he was anti-religious or anti-settler or anti whatever. His articles are a pleasure to read, even though I often do not agree with his opinion, and he is always a pleasure to listen to. here is an interview, 45 minutes, Sarid gave to the Bechadrei Charedim news site. In it he discusses his relations with haredim, his friends, the parking lot protests, and more. שריד from elimand on Vimeo. I don't understand what they are protesting in Iran. The choices of presidential candidates, fro the little I have read on the subject, are all pretty lousy. None of them are pro-democracy, and they are each just bad forms of dictatorial governments. The real change would be to overthrow the ayatollah and make the Iranian government more pro-western, democratic, etc. In Twitter, people have been showing their support with the Iranian protesters by changing the color of their avatars to be green. I do not support the Iranian protesters. I am not against them, but I do not support them. I think they are naive if they are protesting to get rid of Ahmadinejad just to bring in another terrorist dictator. I do not support the murder of protesters, or the neglect, or worse, of human rights, but I do not support the protesters. When is the last time they have supported Israel in our times of distress? Have we heard words of comfort and support from Iranians? Must we act as though we are their friends, when they are not ours? At best, I support chaos. I am even a big fan of chaos. Chaos makes for interesting history. Any support and solidarity I have for the protesters is really just support for chaos. I enjoy seeing chaos wreak havoc like that on an unfriendly country. I support the protests, because it disrupts the normal activities of a hostile country. I support the protests because it diverts world attention, a bit, from putting unfair pressures on Israel while they look at what is going on in Iran. I support Iranian protests because it is the enemy fighting with the enemy, rather than the enemy fighting with us. The only problem with this is what Menachem Begin said - that goyim kill goyim, and the jews get the blame (said in reference to the murders in Sabra and Shatilla during the Lebanon War). At the end of the day we will end up losing no matter who wins in Iran. My avatar is not green. Maybe when I see some Iranian avatars turn white and blue, I'll consider changing my avatar to green. The New Koren Sacks Siddur is mine!